October 7, 2017 By This post may contain affiliate links. 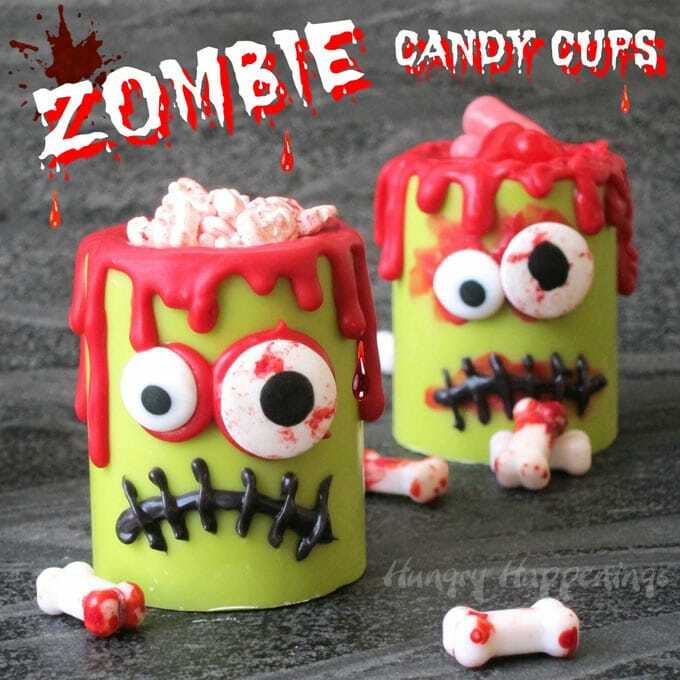 Zombie Candy Cups filled with blood stained candy bones or hot and spicy blood red candies make ghoulish treats for Halloween. 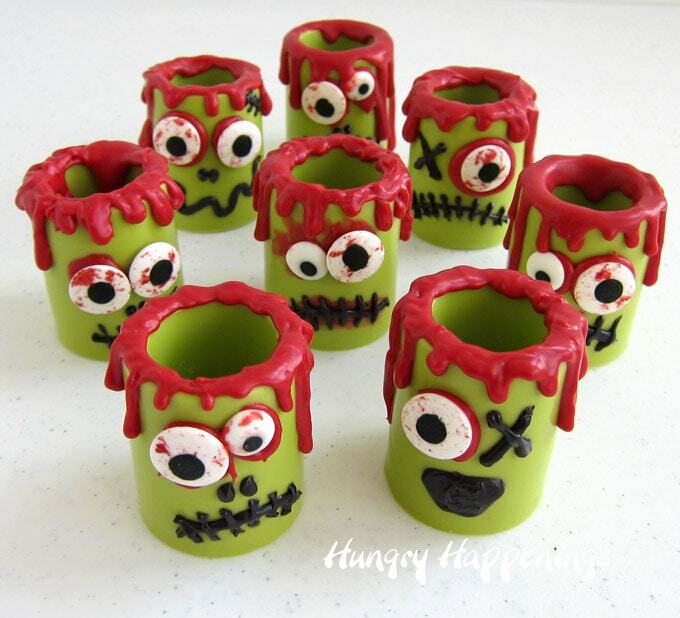 Whether you are into zombies or not, these creepy, yet cute, Zombie Candy Cups would make a fun treat for a Halloween or zombie themed party. I personally don’t have a fascination with zombies and haven’t watched too many movies or television shows featuring the half dead, brain eating creatures. I prefer to watch gorgeous vampires do their thing on the big screen. HaHaHa! I do have to admit though, that I am into having zombies in my house at Halloween. There’s a blood stained, one armed zombie in my kitchen right now. My house is completely decked out for Halloween already. I have some blogging friends coming to see me this weekend so I had to decorate early this year. I am so excited to host these ladies during my favorite holiday of the year. They’ve been reading about my over-the-top Halloween parties for years and now they get to see our elaborate decorations in person. Unlike most years where we decorate the entire house with a theme, this year we chose to decorate every room using a different theme. Some rooms are elegantly decorated while the kitchen is a blood fest. There are bloody body parts all over. Gross, right? I still can’t believe I do this to my house every year. I’m so much more into cute than creepy, but for some reason at Halloween I can totally get into gory decorations. I even enjoy making creepy snacks and treats for the holiday too. In the past I have always displayed all of the desserts for our party on one big display. This year I am playing around with the idea of having desserts displayed in each room. The desserts will match the theme of the room so these Zombie Candy Cups will be in the kitchen. I think my guests are going to go nuts over these edible cups as well as my Frankenstein Candy Cups and Jack Skellington Candy Cups. They are super easy to make using a vibrant green candy melts, red and black candy melts and bloodshot candy eyes. The best part about this project is that the messier you are while decorating, the better. Watch this video tutorial to see how you can make your own set of Zombie Candy Cups. To make these Zombie Candy Cups you’ll need the following supplies which can be found on Amazon.com (commission earned for sales). 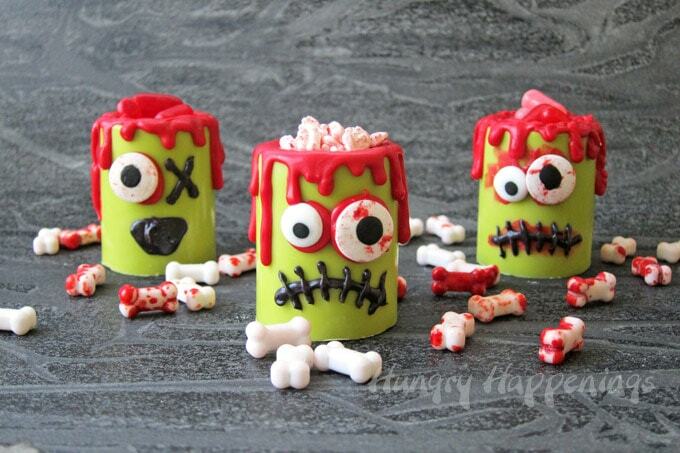 Use vibrant green candy melts to make these edible Zombie Candy Cups then decorate them with bloody candy eyes and dripping red candy melts blood. Fill them with bloody candy bones or spicy red hot candies. Pour the vibrant green candy melts into a disposable pastry bag. Pipe the green candy melts into 8 shot glass cavities in your silicone mold. Tap the mold a few times to remove any air bubbles. Freeze for 12-15 minutes until the candy is hardened. Let sit at room temperature for 5 minutes then un-mold. Push the candy out of the silicone mold to remove. Set aside for 10 minutes before decorating. Pour red candy melts into a disposable pastry bag. Pipe some red candy melts onto the back of a candy eye and press the eye onto the candy cup being sure to smear some of the red candy around the edge of the candy eye. Add another eye, if desired. Pipe drips of blood red candy melts over the top edge of the candy cup. Pop the candy cup in the freezer for 2-3 minutes until the red candy melts harden. Remove and allow the candy cup to sit at room temperature for a few minutes before piping on a black mouth, nose, and scars, as desired. Let the black candy melts dry. Fill the candy cups with candy, pudding, or chocolate mousse. 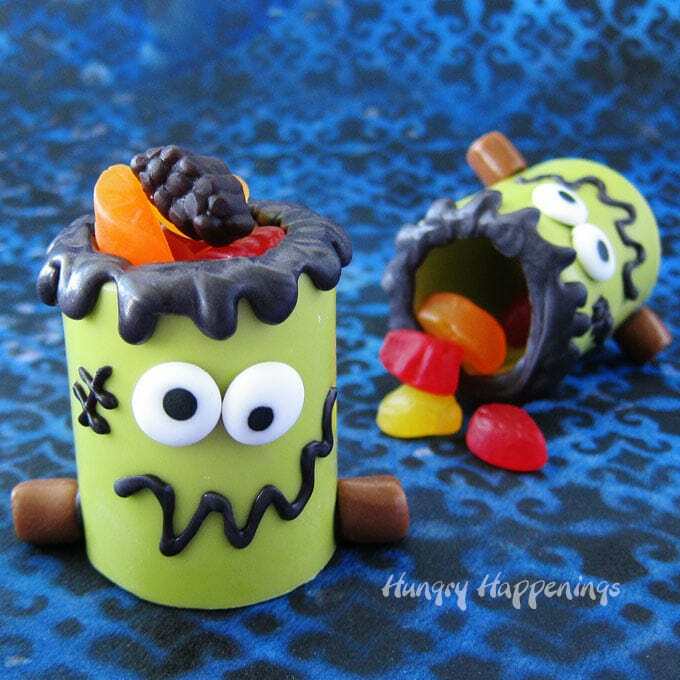 If these bloody Zombie Candy Cups are just too gross for you, but you like the idea of serving edible cups for Halloween, be sure to stop back by on Monday, October 9th to see how to make Frankenstein Candy Cups. They are so cute! 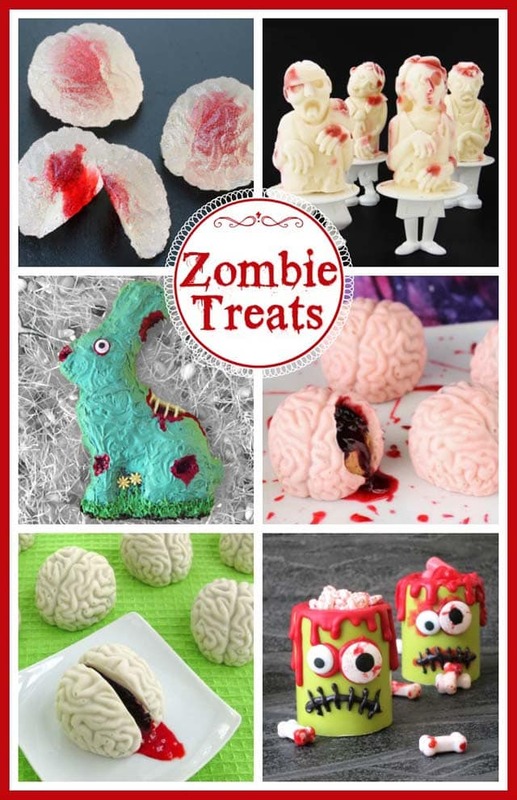 Be sure to also check out all these creepy zombie themed desserts. If you are hosting a zombie themed party, be sure to check out the zombie party we hosted a few years ago. If you make these Zombie Candy Cups and share them online be sure to mention Hungry Happenings and link back to the post. Use the hashtag #hungryhappenings and tag @hungryhappenings. These are amazing an fun! Jeff brought these to work today and shared your website! You are awesome! I love love love these!! I am so happy you stopped by to check out the website and am glad you enjoyed all the treats I sent in with Jeff. Have a Happy Halloween!! !